The Goosebumps series of children's horror fiction novellas by American author R. L. Stine was issued by Scholastic Publishing. The stories follow child characters, who find themselves in scary situations. From 1992 to 1997, 62 books were published in the Goosebumps series. There were also six spin-off series: Goosebumps Series 2000, Give Yourself Goosebumps, Tales to Give You Goosebumps, Goosebumps Triple Header, Goosebumps HorrorLand, and Goosebumps Most Wanted. Another series, Goosebumps Gold, was never released. There was also a Goosebumps TV series and many collectibles. To date, the series has sold over 350 million books worldwide in 32 languages. 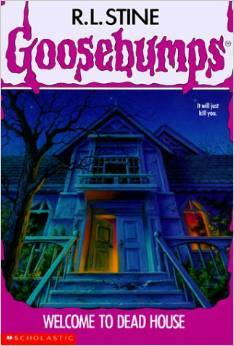 The books in the Goosebumps series feature similar plot structures with children being involved in scary situations. The most of the books are written in first person narrative, often concluding with twist endings. They contain surreal horror, with characters encountering the strange and supernatural. Stine has plot devices that he follows throughout his Goosebumps books and he says he doesn't have any death in his stories, the children in his novels are never put into situations that would be considered too serious. Goosebumps Most Wanted is a new line of Goosebumps books by author R.L. Stine, described as "a brand new take on terror." This line features a new recurring story arc, the 4th since the two-arc Goosebumps HorrorLand and Goosebumps Hall of Horrors. Featuring the return of several of the series most infamous villains, the new series launched in October 2012. "The infamous, Most Wanted Goosebumps characters are out on the loose and theyre coming after you! There is no place to hide. Nothing is safe!" "Catch the most wanted Goosebumps characters--undead or alive..."
Goosebumps Series 2000 is a spin-off of the original Goosebumps series by R. L. Stine. The cover design of the Series 2000 books is different from the original books, though the cover art is again by Tim Jacobus. There are no back tagline anymore, and the paragraphs at the back are excerpts from the book rather than a short summary of the story as the original books' back covers had. There was another difference with back covers too, as the "Reader Beware, You're In For A Scare!" of the original series was changed to "2000 Times The Scares!" and "Welcome to the new millennium of fear". Goosebumps Triple Header is a two volume series containing three novellas each. Goosebumps HorrorLand will be an immersive storytelling experience welcoming fans to HorrorLand, a vast theme park which R.L. Stine describes as "the scariest place on Earth." In a Goosebumps first, the new series will be a serialized adventure, and the story won't end on the final page of book one, Revenge of the Living Dummy. Instead, the spine-tingling and funny bone-tickling adventures will continue on the Internet and in books #1-12, each of which can also stand alone. The first nine HorrorLand books all will feature a combination of frightful new faces as well as the vilest villains from the original Goosebumps series. Ordinary kids are being summoned to HorrorLand-but why? Readers are in for the ride of their lives as the cast of characters trapped in the theme park grows larger with each book, and their situations become more and more perilous. Books #11-12 will take place entirely in HorrorLand. Who-or what-is behind the evil plot to assemble these kids? The answer will be revealed in the final book. Soon after the debut of books #1 and #2, Scholastic also will begin to reissue original Goosebumps books-ten bestselling titles that tie in with each new story as it unfolds in HorrorLand. Each book has two stories. The purpose of the first, considerably longer, story is to introduce the villain and protagonists; the second story shows what happens to the protagonists when they get to HorrorLand, and are united with the other characters. The books also include a case file that links to material on the EscapeHorrorLand.com tie-in website. The final two books in the series serve to wrap up the 'HorrorLand' plot in a single climactic storyline. Tales to Give You Goosebumps (1994-1997) is a series of six books containing ten short, spooky stories each.